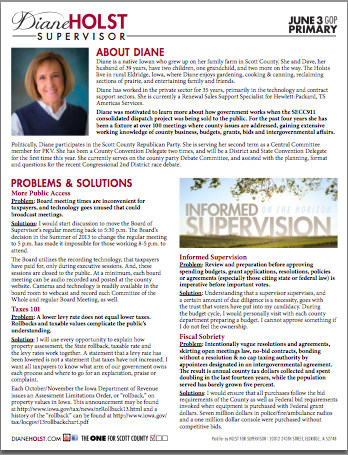 On February 26, 2015 a resolution was moved to approve the 2015/2016 Scott County Budget. I cast a “no” vote for this resolution. A balanced budget was presented by Staff, representing months of work by Administration, Departments and Analysts at the direction of the Board. The five year capital project plan funds a Space Utilization Master Plan of over $12 million for FY15-17. In an effort to alleviate, as much as possible, added interest costs associated with long term financing such as general obligation bonds, Scott County has implemented an aggressive pay-as-you-go philosophy in various expenditure areas. This has been accomplished through implementing a capital improvement levy in the General Basic Fund and annually transferring this amount to the Capital Improvements Fund. The General Fund for the County of Scott accounts for all transactions of the County which pertain to the general administration and services traditionally provided to its citizens except those specifically accounted for elsewhere. I view these as large building projects, and our current economic condition warrants a referendum. Bonding can be avoided through the process of funding the General Basic Fund, and then transferring to the Capital Fund, but not if it leaves the taxpayer out of those decisions. The 15-16 budget includes another transfer of funds from the General Basic to Capital Fund. I was not on the Board when this funding method was implemented. Therefore, my “no” vote is the opportunity to say that large projects, such as those rolling out in the next two years, should follow approval by the taxpayers. We are a County growing at only 1%, and just as we ask our workforce to consider this as we discuss wages, the taxpayers should ask me to consider this fact as capital projects are considered. With this, or any of my votes, please contact me should you have any questions at 563-271-2601 or email at info@dianeholst.com or diane.holst@scottcountyiowa.com.